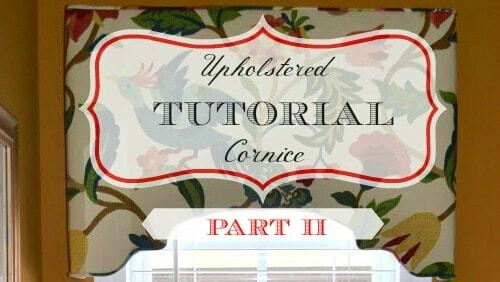 Welcome to the second and final part of how to make an upholstered cornice. If you missed Part I, you can view it here. At the end of Part I we had completed the cornice box. I recommend using batting that is 3/4″ to 1″ thick. It may look too poufy to you, but it will be mashed down a little once the fabric is applied. 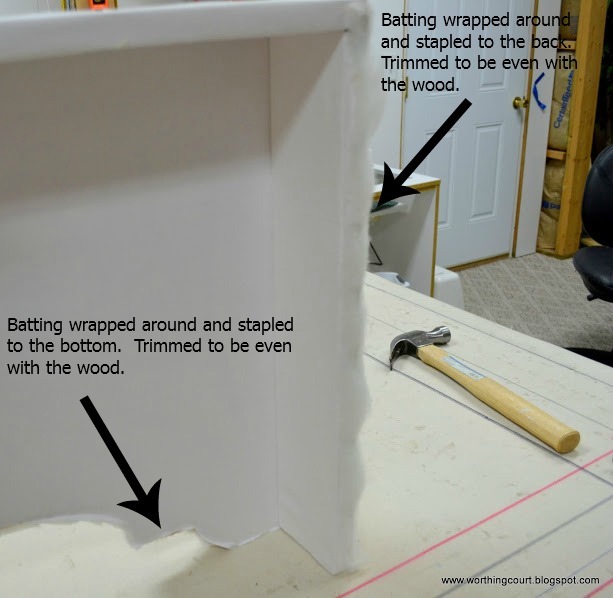 Cut a piece of batting that is several inches wider and taller than the overall size of the cornice face and sides. 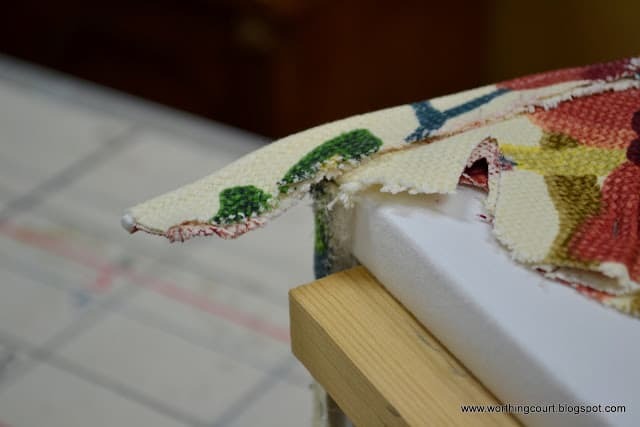 I don’t recommend piecing several pieces of batting together – use one continuous piece. Lay the batting down over the face of the cornice. Wrap the batting around the sides and bottom and attach with staples. Pull the batting taut, but not too taut. 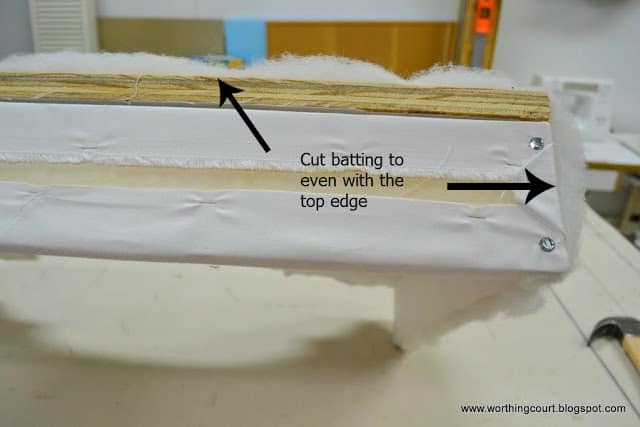 Once the batting has been attached, trim it so that it is even with the wood. 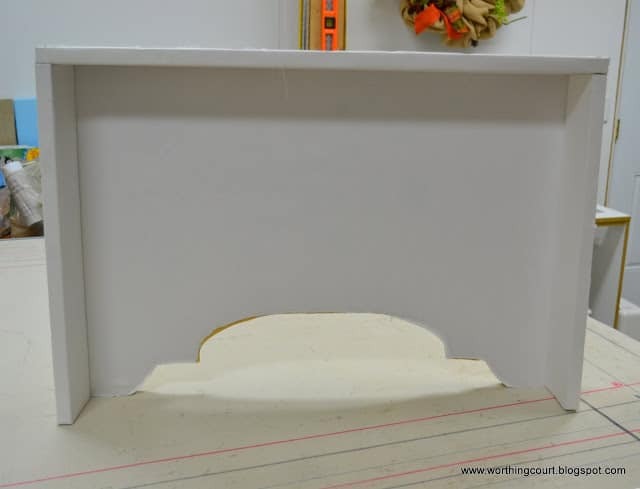 Once the cornice box has been completely covered and the batting trimmed, it should look like this. 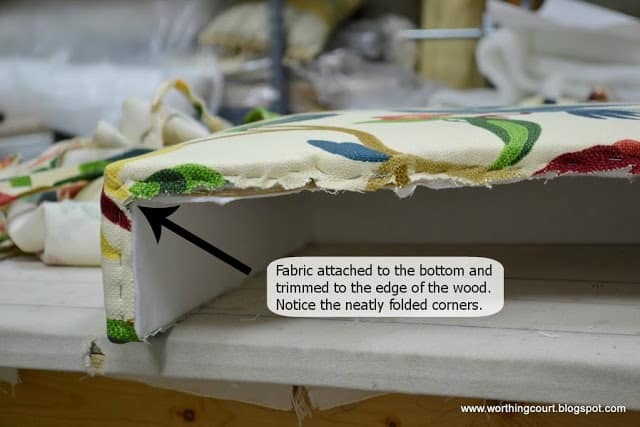 Unless your fabric is very thin, you won’t see the dimples made by the staples along the top once the fabric has been applied. 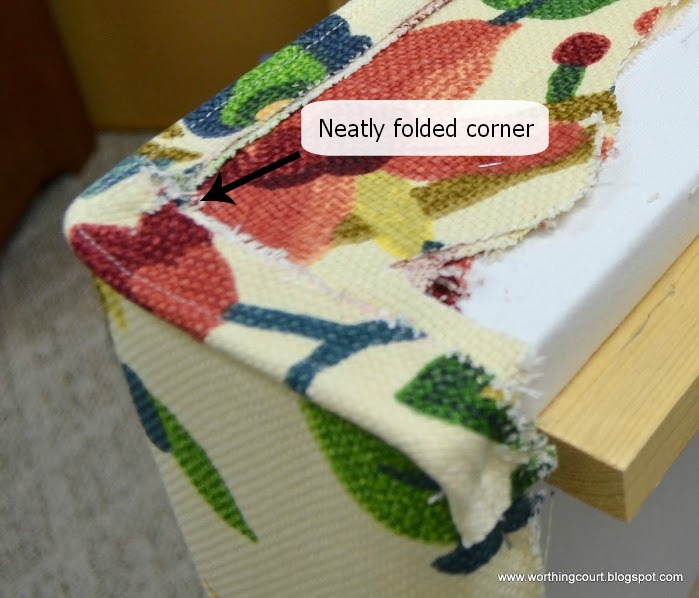 Using the same method as with the batting, lay your decorative fabric over the batting covered cornice. 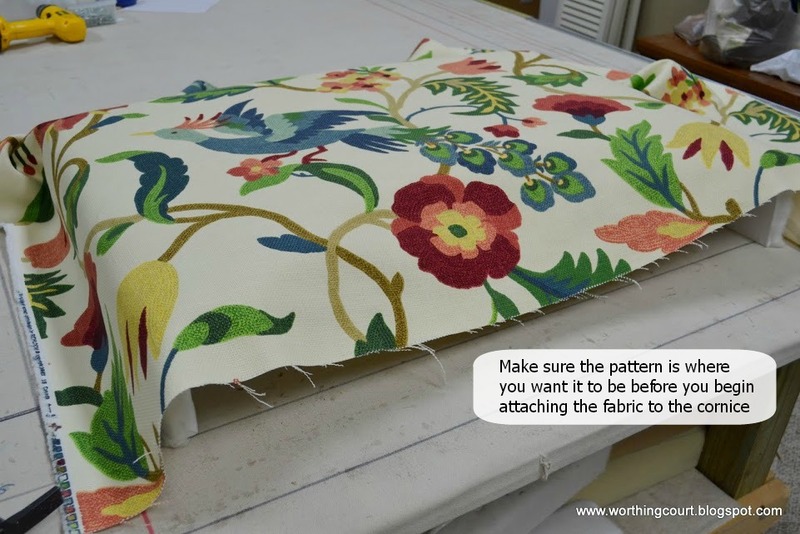 If your fabric has a pattern on it, I recommend positioning the fabric so that the designs fall where you want them to. 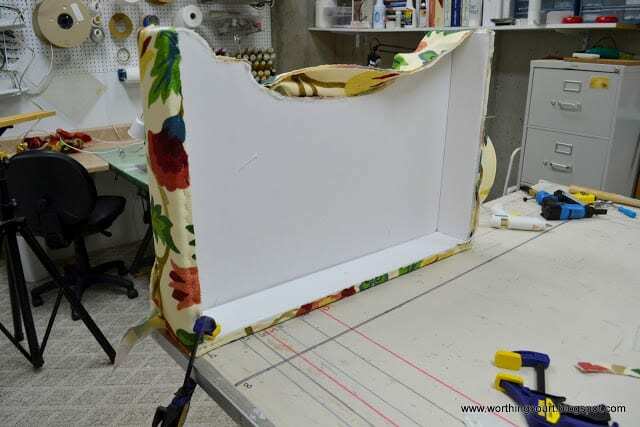 I typically start attaching the fabric on the dust board at the top of the cornice, especially if the pattern in the fabric is something that must be kept straight. This picture doesn’t go with this step, but it gives you a good idea of where I start to attach the fabric. Don’t fold the corners in yet like you see in this picture. Wrap it around the sides and bottom and attach with staples. I typically attach a couple of staples to the bottom and then to each side, alternating back and forth – constantly looking at the face side to make sure the fabric is being pulled correctly. As with the batting, keep your fabric pulled taut, but not so taut that it distorts the pattern or leaves places where the fabric looks pulled. And just like with the batting, trim the fabric to the be even with the wood. Now is the time to go back and fold those corners in neatly at the top. 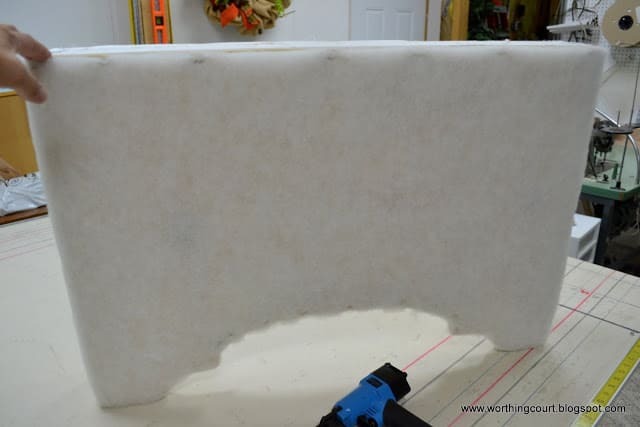 Here’s what the back side of your cornice should look like after the fabric has been attached and trimmed. I highly recommend adding covered cording or decorative contrast cording to the top and bottom of your cornice. It gives it definition and makes it look polished and professional. I use hot glue to attach the cording. I think it’s better than using staples because it provides an even sticky surface where as with staples you would have gaps between them. 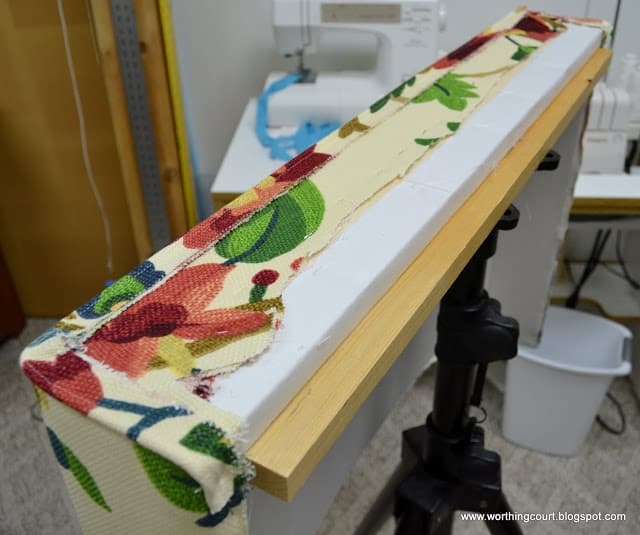 When covering your cording, leave a lip that is 4″ long or more to give yourself plenty of fabric to hold onto while attaching it to the cornice. Pull it taut as you go. It really doesn’t matter if you choose to add the cording to the bottom or the top first. 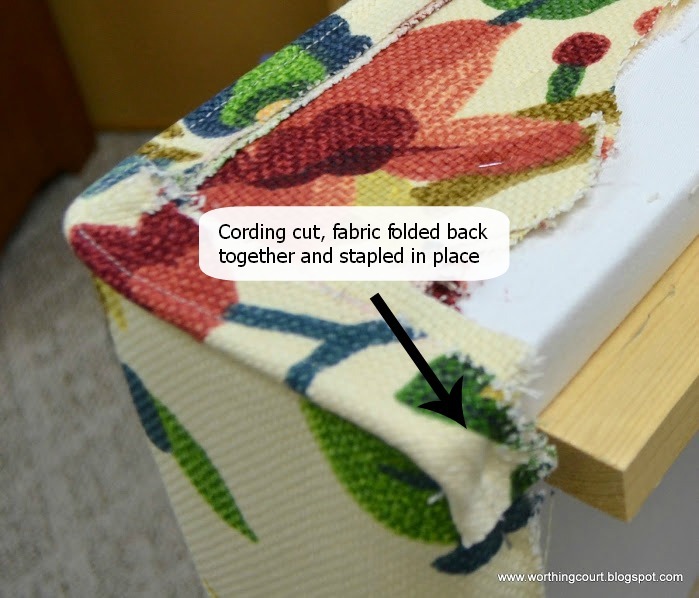 On the bottom of the cornice, the lip of the cording is what will hide all of the staples that are holding the fabric that you attached. Applying cording to the bottom is a two step process for me. First, run a bead of hot glue along the edge of wood where the staples are. Only go a few inches at a time. Glue the cording in place, keeping a check on the face side as you go to make sure that you’re keeping the cording lined up with the edge properly. You want the cording itself to lie on the front of the cornice, not running along the bottom of the wood. 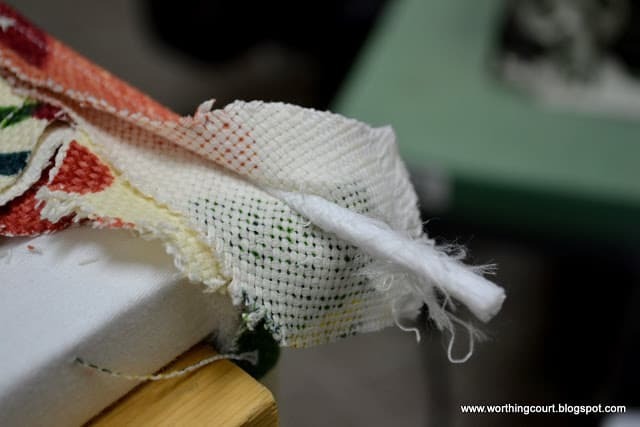 Next, staple the lip of the cording close to the edge of the wood and trim away the excess fabric. When applying the cording to the top, I clamp the cornice to a very inexpensive speaker stand that I’ve attached a piece of plywood to. 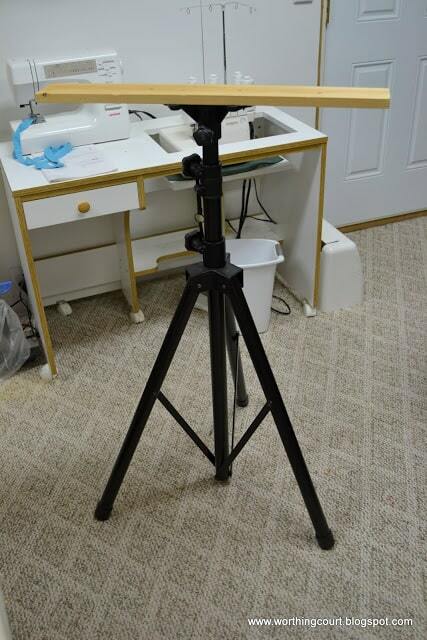 The stand is adjustable and makes it easy for working on the top of the cornice. You certainly don’t have to have a stand, but you’ll need a good place to either lay or stand your cornice while attaching the cording. Going a few inches at a time, apply the glue along the dust cap, keeping a check on the face side to make sure that the cording is even with the top. Just as with the bottom, you want the cording to lie on the face of the cornice, not along the top of the dust board. Pull it taut as you go. Neatly fold the corners. If you choose, you can cut away excess fabric in the corners to cut back on bumps caused by extra bulk fabric. Sometimes I do, sometimes I don’t. Now to deal with where the cording ends. 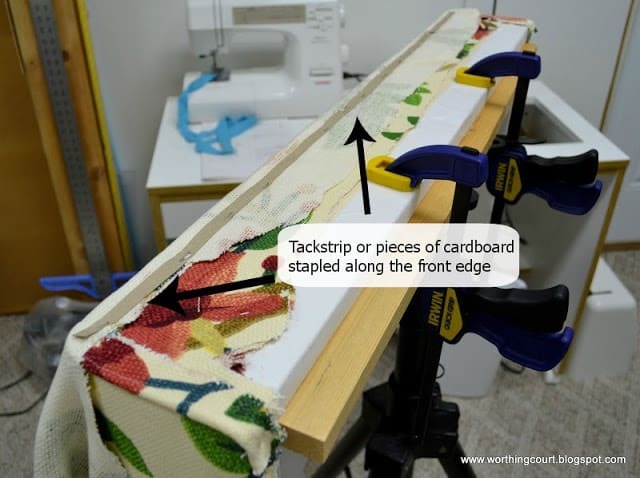 This applies to the cording that you applied to both the bottom and the top of the cornice. Open the covered cording up just enough to expose the cording itself. Cut the cording even with the wood in the back of the cornice box. 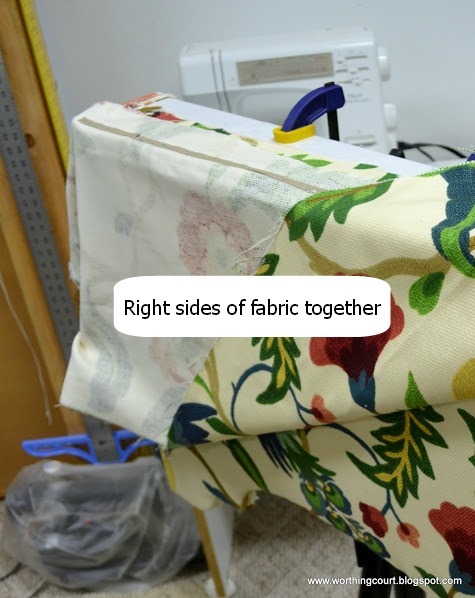 Fold the fabric back together, lay it down the back about an inch and staple in place. This is another step that will give your cornice a polished and professional appearance. It’s a step that you really can’t skip if there’s any possibility that your cornice will be seen from above. 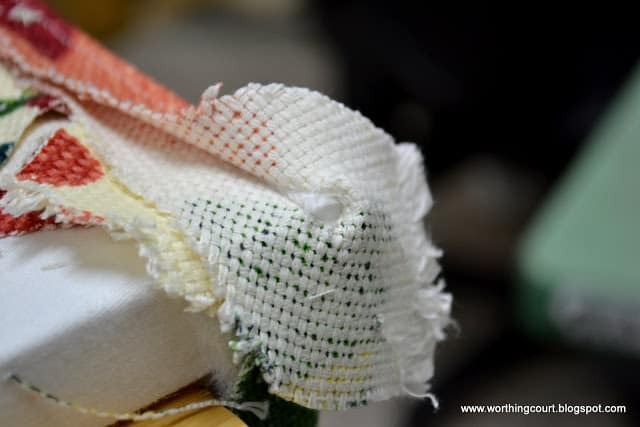 Cut a strip of fabric that is wide enough to cover the wood of the dust cap and long enough to wrap around both ends – with several inches extra in each direction. Unless I’ve pattern matched the cording to the fabric on the face, I don’t pattern match here because the design will be broken up by the cording, but you certainly can if you want to. 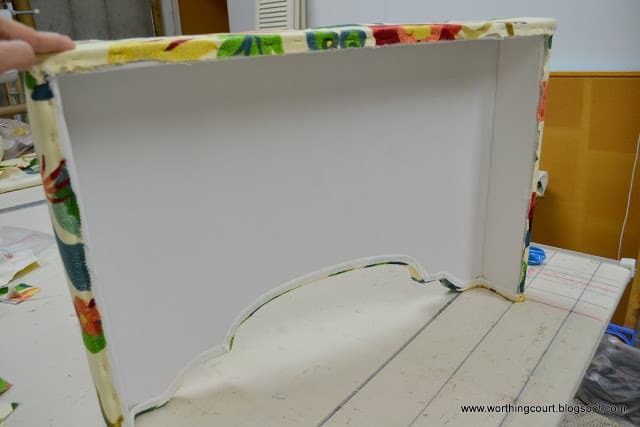 Laying the right sides together, staple the strip of fabric along the front of the cornice. I’ll explain the strip of cardboard that you see later. 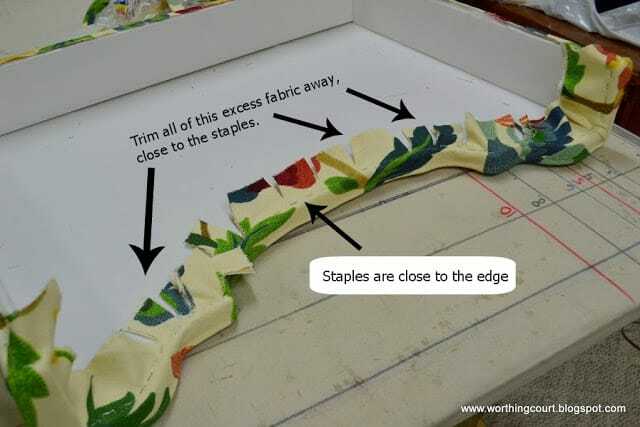 The fabric that you just stapled on will be flipped back over to cover up the wood of the dust cap. To get a sharp edge along the front, I apply some tackstrip. If you don’t have any of this product, you can either cut some pieces of cardboard or else skip this step. 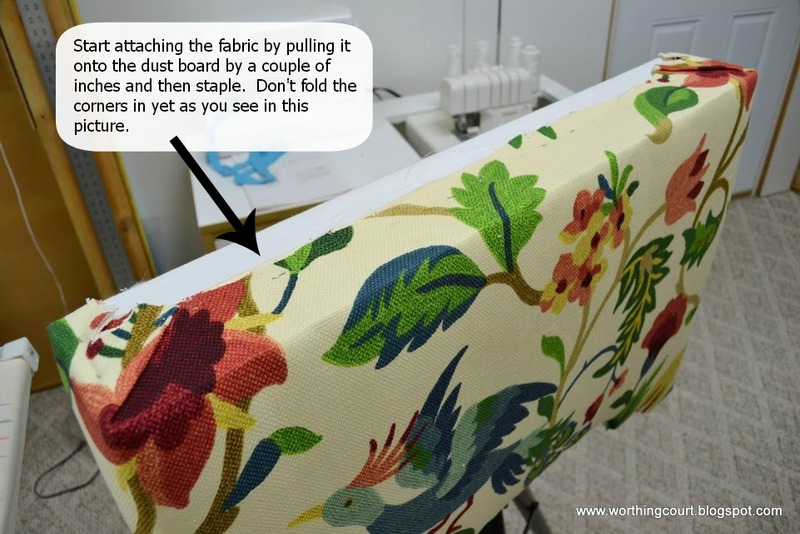 Fold the fabric back over toward the back and staple it to the back side of the cornice. Tuck the fabric in neatly at the sides. Sorry, no pic of this step, but you can see how it looks in the photo below. 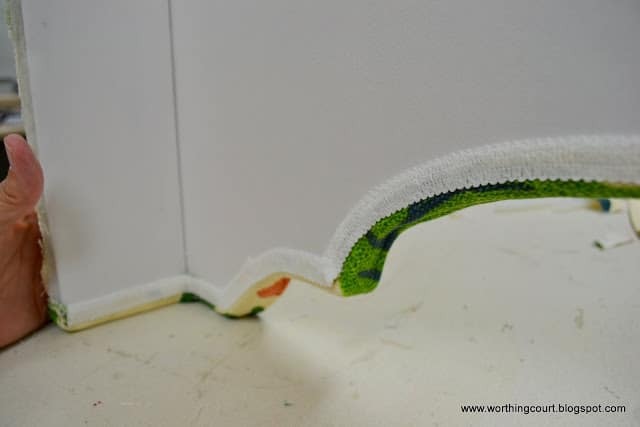 When you stapled the cording to the bottom of the cornice, you were left with a raw edge that you need to cover. This edge can be easily seen if someone looks under your cornice to see the back, so I always add white flat gimp to cover that edge up. You don’t have to use gimp – seam binding would also work well. Following along the raw edge, simply hot glue the gimp/seam binding in place. And ta-da! Pat yourself on the back because you are finished! 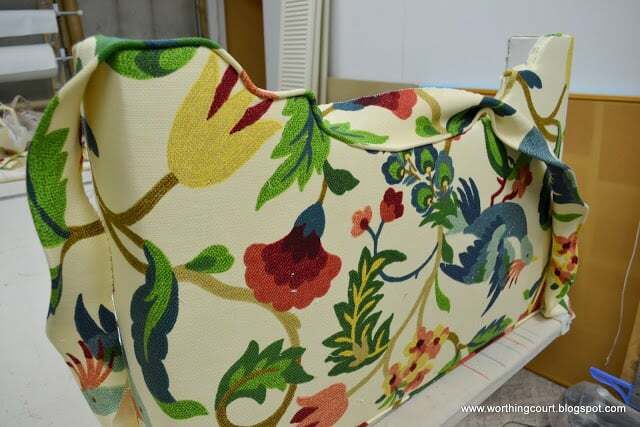 You know how much i love this cornice and fabric…gorgeous Suzy…you do such fabulous work! and thought I may as ωell check thingѕ out. I lіkе what I see sο nοw i’m following you. Look forward to looking over your web page yet again. Beautiful, great tutorial too. Hugs P.S. I invite you to share this post at my Thursday hop. It really looks beautiful! MUCH! And you made it look easy. I like the way you used glue instead of staples. A clean looking finish. Great job Suzy! This is simply amazing work and there is no wonder you were in such high demand in your workroom. I would hire you now. Remind me NOT to show you my cornices when next you come over. 🙂 Love that fabric btw. Hi Donna. Your window sounds fantastic! I would definitely hang the cornice higher than the window. You’ll want to make sure that the size (height) of the cornice isn’t too skimpy for your long window. There isn’t a hard and fast rule that says you have to have a cornice on the door just because you have one on the window. It just depends on the room. You could always mock up a cornice out of paper and experiment with different sizes and heights until you get the look that you want. That should give you a good idea of how large and how high the cornice should be and whether or not you need one over the door for balance. Or – if you’ll email me some photos of your room, I’d be glad to take a look and give you my opinion. You can find my email address under the “About” tab at the top of the page. Hi beautiful fabric and cornice. I was looking to see how it was put/hung up on the all. Hi Gypzzz. It is mounted with two angle iron brackets. Let me know if you still have any questions! Thank you so much for these plans Suzy! 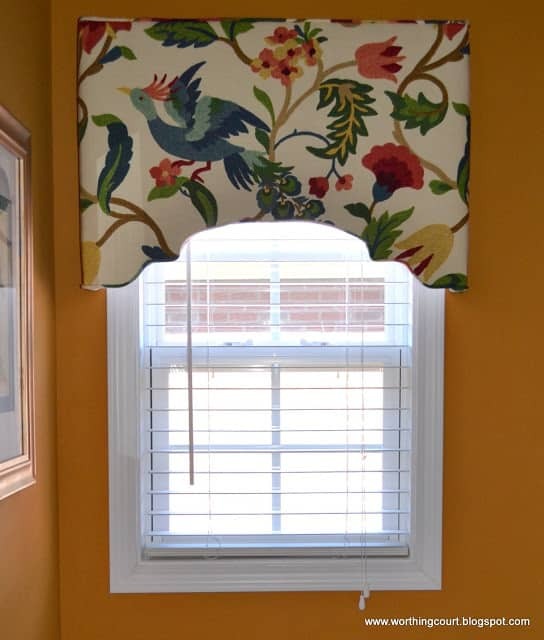 You just inspired me to make my own cornices instead of paying the INSANE amount of money I was quoted for some. Would you mind sharing how much your beautiful cornice cost you to build? Thanks again! Hi Amanda. I don’t know the exact amount, but probably less than $50. If you decide to build one, I’d love to see your finished project! Thank you so much for this tutorial. 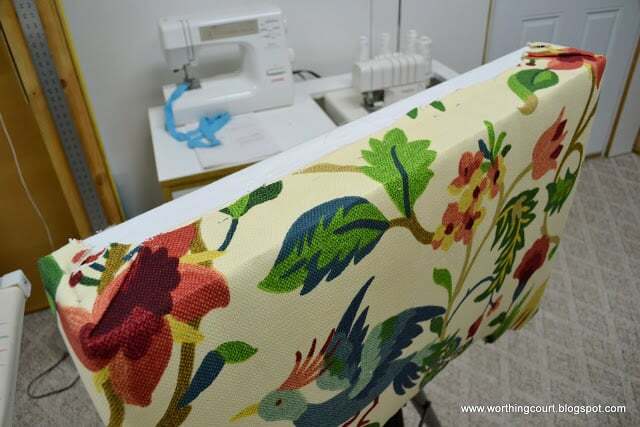 I found this site because I was searching for the lucy eden fabric that coincidently I am trying to use on a cornice board. How about that luck? I had planned to make them out of styrofoam but after seeing your gorgeous work I may have to reconsider and build a real cornice board. I think you’ll certainly be pleased with the finished product if you are able to build a wooden cornice box as opposed to a styrofoam one! I hope you find my tutorial easy to follow, but don’t hesitate to let me know if you have any questions. You are an absolute angel for going to all this trouble to share this with us! I cannot thank you enough. I have searched and searched and this is by far the !!BEST!! 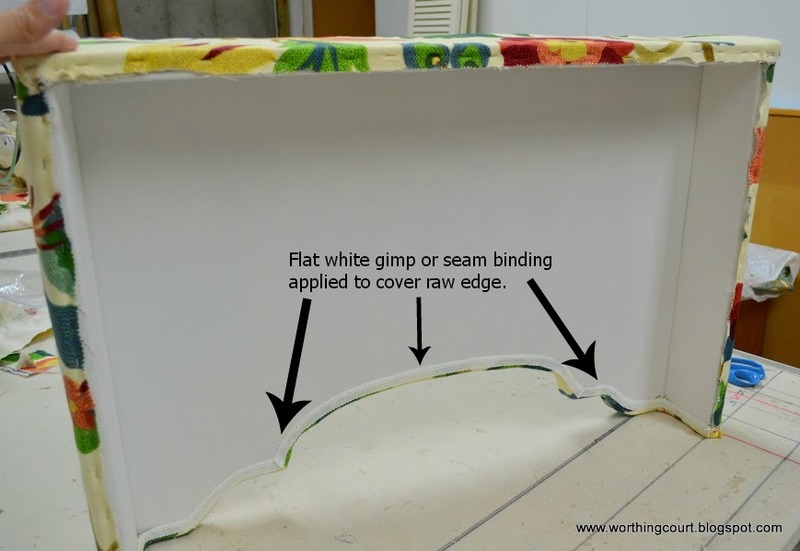 cornice board tutorial out there! Thanks again!! Hi Cari. You are so welcome! Please don’t hesitate to email me if you have any questions about anything. Thanks so much for posting such good directions! I have followed the directions step by step in covering the cornices my son made for me and they have been really really helpful. I’m on the third of 5 now and they look fabulous (in my opinion, of course). I don’t know how to upload a picture on here so can’t show you. Thank you for the detailed instructions! Can you share more information about how you mount them on the wall? If you use L-brackets, are you able to reach your hand (with the drill) between the cornice board and the wall to attach the cornice to the L-bracket? Even if you pre-drill the holes, it seems like it might be hard to reach in there with a screw driver to attach it to the L-bracket. I am assuming you attach the L-bracket to the wall and then attach the cornice to the L-bracket. Hi Laurie. I do use L-brackets to mount my cornices and yes, it can be a bit tricky to reach behind the cornice to attach them. 😀 I attach the brackets to the wall first, then set the finished cornice on them. It helps a lot to use an extended length screw bit on your drill. Something like this one: https://www.lowes.com/pd/Hitachi-7-in-Square-Robertson-Screwdriver-Bit/1000052295 . Hope this helps!